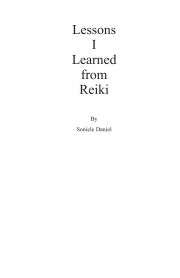 Description of "Lessons I learned from Reiki (eBook)"
All spiritual healers share a lot of experiences and victories which they have brought in other people life, very rarely people share the small changes that has happened in their life, and what made them stick to it. This book wants to represent in short how does spiritual practice (in this case Reiki) has brought many changes in a practitioners life. Soniele Daniel is a Reiki Teacher. She is emotionally attached to Reiki as she feels when she was nowhere, Reiki came to rescue her. She is into various healing practices, and also has a free fortnightly spiritual e-newsletter which goes by the name "SAC Divine Touch" Though she has done her Masters in Statistics, she felt spiritual healing to be her true calling. Reviews of "Lessons I learned from Reiki (eBook)"